Ardis icons & Ardis-Basic sets are elegant and simple by design, it is a perfect choice for those who loves simplicity. 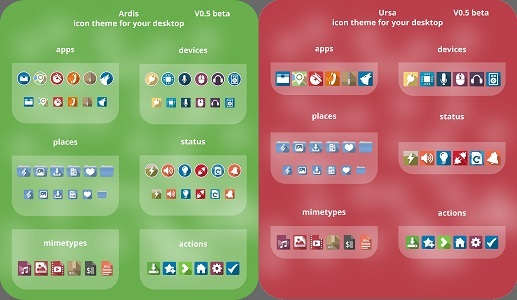 Ardis icon project is inspired from Numix utouch icons but completely different and beautiful. This icon theme has variety of nice colors, great looking circled shape icons with long shadows. It is compatible with most Linux desktops such as Unity, Gnome, KDE, Cinnamon, and others. This icon set contains 25000+ unique icons, the original creator of the icon theme abandoned the Ardis which is unfortunate for a great looking icon theme but good new is that ZMA has taken charge and now supporting it, ZMA also introduced new Ardis variant called "Ardis Square", so right now it is in active development that means you can contribute to this project by reporting any missing icon or sending feedback. You can use Unity Tweak Tool, Gnome-tweak-tool to change icons. Did you like these icons?